Hello dear artists and comic book lovers. This drawing lesson focuses on how to draw Kitty Pryde from X-Men. 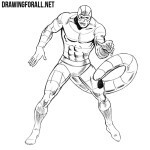 As you know it is a character who appeared in the comics of Marvel Universe. First she wore the names Sprite and Ariel, then became known as Shadowcat. As always, this lesson begins with the drawing of the skeleton of our character. First of all, we sketch out a head in the form of an oval. Next, we sketch out the line of the spine, on which the thorax and pelvis are located. Next, sketch out the arms and legs. All these lines must be drawn with very light lines. Now let’s work with volume of the body. But first of all we will sketch out the intersecting lines on the face. Next, outline the neck and torso, which narrows at the waist and widens in the hips. 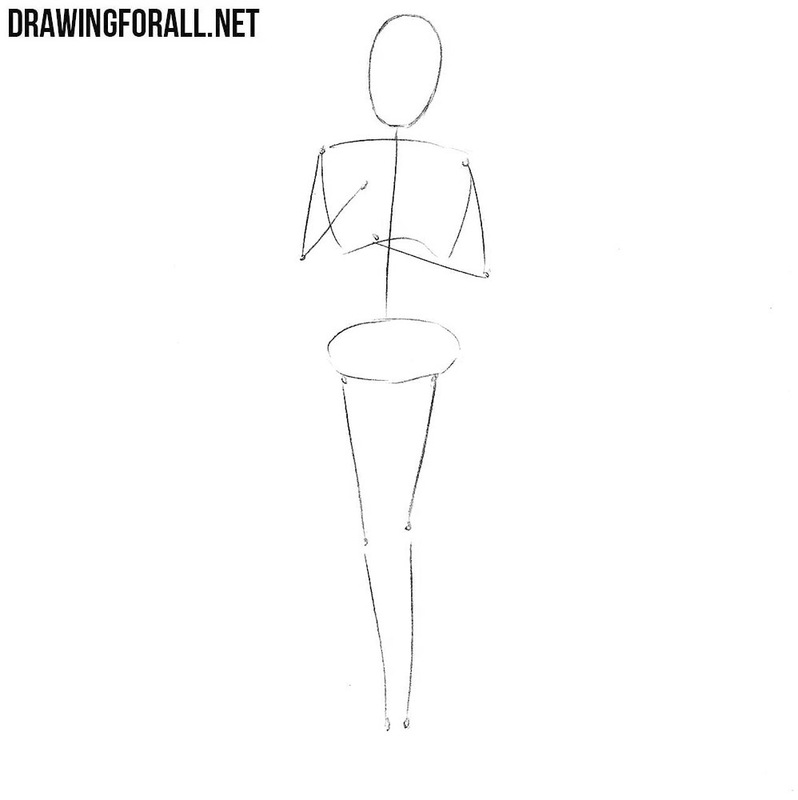 Now sketc hout the arms and legs with the help of very simple geometric figures. Now let’s add some basic details to our Kitty Pryde drawing. Let’s outline the hair and facial features. Further using smooth lines circle the whole drawing, connecting the geometric figures from the previous step to make the body more realistic. Add the outlines of clothing, belt and gloves. Now let’s draw Kitty Pryde in detail. 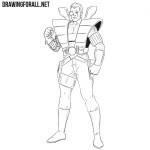 Using clear and dark lines carefully draw out the outlines of the head. Next, draw the hair as in our example. Draw the eyes, eyebrows, nose and lips. At the end of the step, we will need to delete all unnecessary lines. Now de draw out the details of Kitty Pride’s upper body. 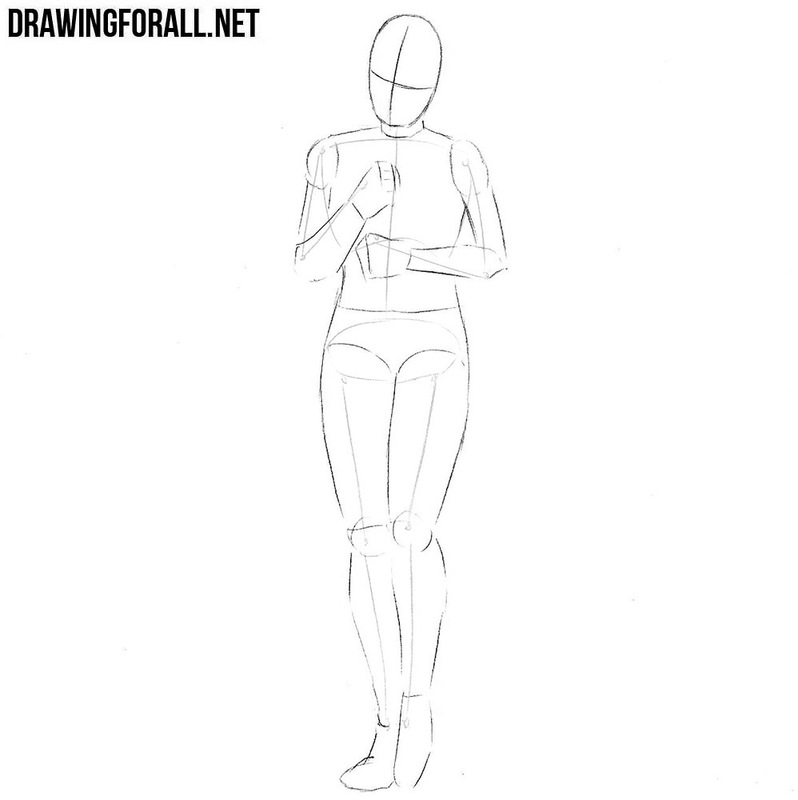 Carefully draw out the outlines of the upper body parts using clear and dark lines. Draw out the clothes and add the necessary folds on the clothes. Remove all unnecessary guidelines from the top of the body. It remains only to draw the lower part of the body. As in the previous step, using clear and smooth lines, carefully draw out the outline of the legs. Remove all unnecessary guidelines from the legs, draw the shoe lines and add a few folds. Now it only remains to add shadows to the Kitty Pryde drawing. 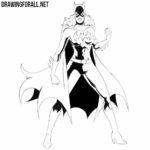 You can make shadows like in a lesson about Spider-Man (dark and black areas of shadows) or as in a lesson about Scarlet Witch. Here we apply the second option – that is, we will use light hatching to draw shadows. It was a lesson on how to draw Kitty Pryde from Marvel. If this lesson was interesting to you, then be sure to subscribe to us on social media and share this drawing lesson with your friends.